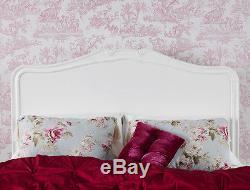 Juliette Shabby Chic White Double Bed with wooden headboard. 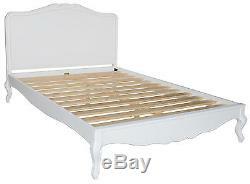 The Shabby Chic White Double Bed produced in the antique French style in true white finish. This very pretty bed with wooden headboard and beautifully curved foot end and sides will look fantastic in any bedroom. This bed has got central support bar with legs and wooden slats for maximum support. It fits UK standard double mattress 4ft6. The under bed clearance at the lowest point of the curved side rail is 22cm. Please note: Juliette bed is delivered partially assembled to ensure easy access to the bedroom. More products from this range are available. Watch our assembly video of Juliette Bed. For different sizes or types, please see our other listings by clicking on below image links. The Juliette Furniture Range is available in True White and Champagne/cream colour. To view more items from these ranges, please see our other listings by clicking on below links. Dimensions: W:148cm (58.27") H:124cm (48.82") D:208cm (81.89). Features: centre bar and leg for extra support, wooden slats. We strive for 5 out of 5 star service. We will do our best to put things right. NOTE: Please supply your telephone number with your order. We cannot dispatch without it. Most of our large and heavy items are delivered by our own vans to ensure the safe arrival of your furniture. In order to keep these charges to an absolute minimum and ensure that your furniture arrives in pristine condition, we deliver by using our van with 2 men to unload and place in a room of your choice. The item "JULIETTE Shabby Chic White Double Bed, Stunning Wooden headboard 4ft6 bed base" is in sale since Friday, March 28, 2014. This item is in the category "Home, Furniture & DIY\Furniture\Beds & Mattresses\Bed Frames & Divan Bases". The seller is "bedroom_furniture_direct" and is located in Herefordshire. This item can be shipped to United Kingdom.